Fried breadcrumbs are a staple in my kitchen. I use them for textural contrast and to help provide little bursts of flavor. They’re also seriously useful as a substitute for grated cheese. Although delicious by itself, this dish expands in flavor when combined with other hearty winter greens such as kale, escarole and chicory. Exact quantities are not given in the recipe; adjust to your own preference. Gently warm oil in a small skillet over medium heat. Add the breadcrumbs. Sauté until the crumbs are crisp and golden. Taste for salt and pepper. Mix well. Store in the refrigerator in a tightly covered container; keeps for up to one week. Bring a large pot of water to a boil and add a generous pinch of salt per quart. Drop the watercress into the pot and cook uncovered until the cress is tender, about 5 to 15 minutes, depending on the quantity and degree of desired doneness. Drain, press out excess moisture, then coarsely chop the greens. Toss with a little sesame oil or extra-virgin olive oil. Taste for salt and pepper. 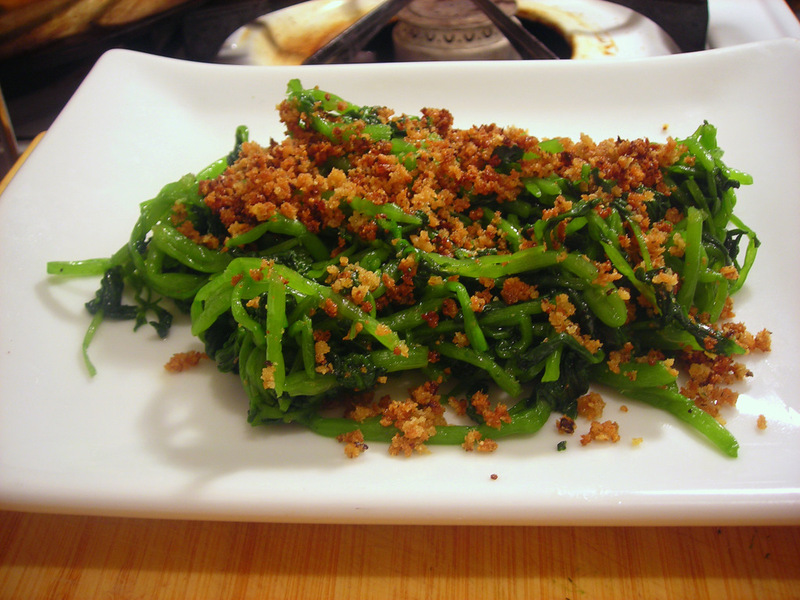 Sprinkle with crispy fried breadcrumbs and lemon juice, then serve at once. Time: 15 to 30 minutes, including prep. 04 Jan	This entry was published on January 4, 2012 at 12:01 am. It’s filed under food, food photography, general, vegan and tagged appetizer, side dish, vegetarian, watercress. Bookmark the permalink. Follow any comments here with the RSS feed for this post. So do I. My problem (well not really), is that I use it as fast as I make it. Variations include — flavored with chopped fried garlic; with anchovy, garlic and mint; with lemon basil and parsley. I do something similar with the crusts of all those multigrain sandwich loafs. I add some garlic slices to the oil and scoop them out before adding the breadcrumbs.